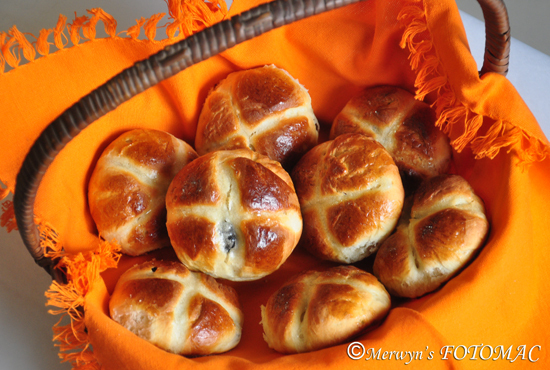 Hot Cross Buns are traditionally served & eaten on Good Friday. The tops of the buns are marked with a ‘cross’ which symbolically represents the Cross of Christ & the Crucifixion. Soak currants & raisins in some water for about 10 mins. Drain & keep aside for later use. Warm the milk gently in a saucepan with cinnamon, green cardamom, cloves, nutmeg & saffron until it boils & then immediately take it off the heat & allow to stand for 1 ½ hrs. Strain the milk. Add 1 tsp. sugar & fresh yeast in lukewarm milk. Stir to dissolve yeast completely. Set aside for about 10 mins or until the mixture turns foamy. Meanwhile, combine flour, sugar, ginger paste, salt & rub in the butter. Make a well in the centre of the flour & add the beaten eggs & the yeast mixture. Mix to make a soft dough. Knead for 15 mins. & place the dough in a lightly greased bowl, turning the dough once so that the top is lightly greased. Cover with a cling film/plastic wrap & place in a warm spot to rise until it has almost doubled in size (1 ½ – 2 hrs). When the dough has doubled in size, gently punch it down to release the air. Knead the dough on a lightly greased surface for a couple of mins. Then spread the dough, add the dry fruits & knead all the fruit into the dough. Divide the dough into 12 equal pieces or 16 equal pieces. Roll each piece into a small round ball & place on a parchment lined baking sheets. They should be spaced so that they have enough room to double in size. Brush the tops of the buns with egg wash. This will make them golden brown. Place covered with plastic wrap in a warm spot & allow to prove until almost doubled in size (about an hour). Cut a ‘cross’ in the top of each bun with a sharp, lightly greased knife. Make a thick stiff paste with maida & sufficient water. Pipe on the marked cross on each bun. Bake the buns for about 15 mins or until the buns are nicely browned. Brush each bun with a mixture of 1 tsp. caster sugar mixed with a little hot water before placing them on a wire rack to cool. This will make the buns glossy. Combine icing sugar & milk until smooth. 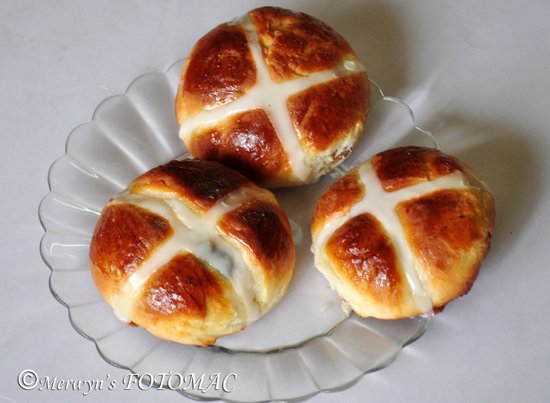 Place the glaze in a piping bag & pipe a ‘cross’ on the top of each bun. 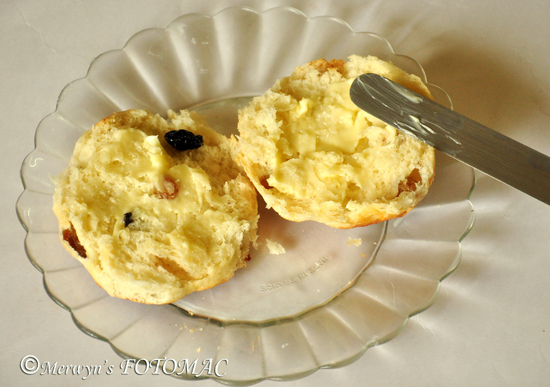 Serve with butter or enjoy it plain with a cup of tea or coffee. Droooooooooooooooooool!! they look so so so delicious. They looks fabulous,soft and super yum,bookmarked..will surely give this a try..